The climax of the ALS Ice Bucket Challenge has come and gone, but there are still plenty of people dumping freezing cold buckets of water on their heads to raise awareness about amyotrophic lateral sclerosis (ALS, also known as Lou Gehrig 's Disease). 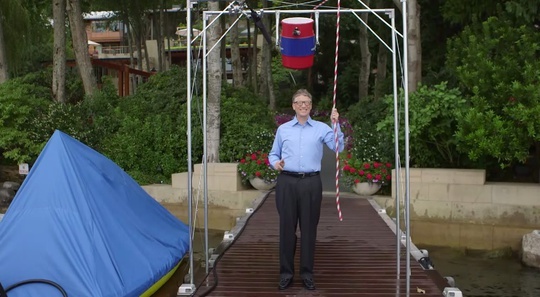 The ALS Ice Bucket Challenge not only raised awareness about ALS, but it also helped many brands step into the spotlight and market themselves while supporting a great cause. And the best part: the Ice Bucket Challenge raised more than $94.3 million to fund future ALS research. But there have been tons of awareness campaigns for diseases and disabilities in the past. What made the Ice Bucket Challenge so successful? I can think of at least 10 reasons for the ALS campaign's success and, as it turns out, they're pretty universal. Almost everyone loves to be challenged to do something. Of course, the challenge should be something fun and relatively easy to accomplish if you really want it to catch on. Asking people to dump buckets of ice water on their heads was a great strategy for the ALS campaign because it dared people to overcome something mildly unpleasant, while still being quite easy to accomplish. Not everyone will participate in your campaign. Plenty of people will be quite content to cheer for your cause from the sidelines without getting physically involved. However, you would be remiss to not pick up some extra social shares and links from your enthusiastic bystanders. Make sure that your campaign will be fun and entertaining for the people who choose to watch from the sidelines and you'll earn additional exposure and brand recognition. Another key success factor for the Ice Bucket Challenge was the constant use of videos that accompanied the campaign. Including multimedia elements like videos and images in your campaign can do wonders for your click-through and sharing rates. Take this into consideration when planning your campaign from the beginning and you can have a well-incorporated multimedia strategy to boost social shares and viewer interest. Having a really cool idea for your marketing campaign is great, but how easy is it for others to participate? ALSA.org did a great job of making sure that the majority of its targeted audiences would be able to engage with their campaign. After all, all participants needed was a bucket, some water and some ice. Aim to make participation in your campaign as easy as possible and you'll stand a much better chance of raising awareness about your cause, brand or product. Granted, we can't all get the slew of celebrities the Ice Bucket Challenge had participating in our campaigns, but one even mildly well-known person can do a lot to further the end results of your marketing efforts. Reach out to lead influencers in your industry, in your company's hometown or wherever else you frequent. Another important detail not to overlook in the ALS Ice Bucket Challenge is that each person who participated in the campaign had an opportunity to tell his or her own story. Many people chose to talk about why doing more medical research on ALS is important, reminisce about a loved one who had lived with the disease or simply remind others to support a good cause. Find a way to let people use their own voices in your campaign and you might just see some amazing results. In addition to letting people tell their own stories, the Ice Bucket Challenge also gave each participant the opportunity to get creative with their buckets of ice water. For example, the Foo Fighters did a fantastic job spoofing the 1976 version of Carrie in their ALS video and Bill Gates made an elaborate pulley system to show off his nerdy side. But it wasn't just celebrities that were able to get creative with their Ice Bucket Challenge videos. Businesses and companies all across the country were able to put their brand's spin on their videos. For example, this Mustang parts dealer did a burnout in one of their cars after thoroughly dousing all of their employees in ice water. Give everyone a chance to use their creativity with your campaign, and you'll end up with tons of interesting content that you can, in turn, use to further your message. By far, one of the most attractive features of completing the Ice Bucket Challenge was the right to tell everyone you know that you helped raise awareness about ALS. To me, this is without a doubt one of the main reasons that this campaign caught on so quickly. People were proud to say that they participated in it. Ever wonder how well the Ice Bucket Challenge would have done if the ALSA would have tried to run the campaign in January? It definitely would have been more of a challenge, but it probably wouldn't have seen nearly as much participation and success as it did this summer. Keep your target audience's seasonal preferences in mind and you'll be able to optimize your campaign's results. Lastly, though certainly not least, marketers need to remember to teach something valuable with their campaigns. The Ice Bucket Challenge not only raised a ton of money for ALS research, but it also got many more people interested in learning about what ALS is and why it's important to work towards finding a cure. I'm not saying that if you use all of these tips in your marketing campaign Bill Gates will dump water on his head for you. But if you try to incorporate as many of them as possible into your next content strategy, you'll likely see some pretty good results. This guest article was written by Kayla Matthews, a blogger with a passion for business solutions, social media and marketing. Follow her on Google+ and Twitter to read all of her latest posts.